Headlining the fourth installment of the annual Korea vs. Japan showdown on Sunday at the New Ansan University Gymnasium in Ansan, South Korea, OPBF #2 ranked super bantamweight Jaesung Lee (16-3-1, 9 KO) and Japan #12 ranked featherweight Akihiko Katagiri (13-7-1, 4 KO) squared off for the vacant WBO Oriental super bantamweight title. While neither contender has yet established themselves among the elite in Asia, both have faced world-class competition abroad. At first glance, current Korean super bantam champion Lee, who first seized this title in 2006 and regained it in April of this year (with a brief stint as IBF Pan Pacific super bantam champ in 2011), appeared the prohibitive favorite. In fact all three of Lee’s losses came in the United States, the first by four round unanimous decision at Dover Downs in February, 2008 against seasoned veteran and former IBF bantamweight title challenger Jesus Salvador Perez. Four months later, Lee was halted in four at the Orleans Hotel and Casino in Las Vegas by a then up-and-coming Mikey Garcia. However, after being stopped in Yankee Stadium by then undefeated top prospect Jorge Diaz (TKO 6), Lee returned to Korea and embarked on an impressive six-fight winning streak. What makes this streak most impressive are his victories on the road against solid opposition in Japan—in 2011 against current OPBF Featherweight contender Akihiro Matsumoto (TKO 1), and in 2012 versus the 5’11 bantamweight southpaw Yoichi Oguma (MD 8), and rock hard Seigo Sato (UD 8). The significant disparity in win-loss ratio, KO power, title achievement and overall experience suggested Katagiri would become Lee’s fourth Japanese victim. However, closer inspection of Katagiri’s record revealed that he might present a tougher test than Korean boxing insiders anticipated. Of Katagiri’s seven losses, four were by split decision. Having fought all but one of his bouts against all comers in the Tokyo area, the durable Katagiri’s lone KO defeat came this April on the world stage at the hands of Jhonny Gonzalez (TKO 4) in a non-title twelve rounder in Mexico City. The odds swung even more into balance at the weigh in. While the 5’8” Katagiri passed on his first attempt, Lee—who at a hair under 5’10” has had difficulties making weight in many of his recent bouts—came in over. Thoughts of an easy Lee victory were all but erased after he failed to make weight on his second attempt. After more exercise and sweating, Lee managed to squeak under the limit the third time around. The pattern of the bout was set from the opening bell. Katagiri pressed the action, moving forward with head-rocking upper-body movement and stiff jabs, while Lee—who looked slower than usual—patiently circled back in a crouch, looking for right hand counters, his left hand low. While Lee made good use of his height advantage on defense, Katagiri quickly established the superior jab, landing several flush lead blows that got Lee’s attention, snapping his head back and causing him to take a deep breath. Still, Lee remained composed, closing the round with a nice one-two. In round two, Katagiri upped the pressure, landing power jabs and double jabs, while Lee again came back with a solid right hand counter before the bell to have Katagiri holding on. While Lee started off round three on his toes, ripping right and left uppercuts to the body and head, Katagiri quickly re-established his jab, snapping back Lee’s head. Following up on his lead blows, Katagiri started to land right hands and one-twos near the end of the round. Katagiri continued to control the pace in round four, bloodying Lee’s nose with his no-motion jab. The tide shifted in round five, when Lee became more aggressive, landing a short right hand after a one-two, then a counter right hook on the point of Katagiri’s chin that rocked the Japanese contender. Going for the knockdown, Lee followed up with another short right, but Katagiri just smiled and moved in to a clinch. Lee’s attacks proved sporadic, as Katagiri connected with a right-straight left combination at the end of the round. Before round six, both corners were treating their combatants for nasal bleeding. Swollen below the right eye, Lee came out more elusively, circling backward to his left, his head slightly canted to the right. Katigiri applied non-stop forward pressure, landing a couple nice one-twos, but found it difficult to cut off the ring, and Lee responded with some sharp jabs of his own from the hip. The action continued in the seventh, with Katagiri jarring Lee’s jaw with a right hand counter of Lee’s own counter right. In round eight, Katagiri pushed the action with his well-timed jabs and one twos. Unable to win the battle of jabs, Lee lashed out with some effective lead left hook-straight right combinations, and employed the Archie Moore cross-arm defense when pressed into the corner. Round nine saw another turn of the tide: under pressure from Katagiri’s unwavering straight-punching attack, Lee landed a short right counter and follow-up flurry of uppercuts and hooks that hurt Katagiri at the end of the round. Lee attempted to capitalize on this by uncharacteristically launching himself into furious attack mode from the bell opening round ten. Lee connected with several clean shots, including a vicious left uppercut, left hook combination. Katagiri, struggling to hold on to the rapid-firing Lee, managed to weather the storm, pushing the out-of-ammo Lee back into ropes with a two-fisted body attack. Katagiri took the first of the championship rounds, pushing Lee around the ring with his ramrod jabs and one-twos. Even while backpedaling, Lee managed to land a couple sharp counter left hooks. In the final stanza, though visibly tired and suffering from a badly swollen right eye, Lee connected with the sharper blows—mostly counter shots—while Katagiri continued full-steam ahead, landing a good left to the body, straight right combination. The Japanese judge scored the bout 115-113 for Katagiri; the Korean judge tallied 116-112 Lee; and the judge from Thailand had it even at 114-114. In holding the local favorite to a draw, the disciplined, determined Katagiri, at age 27, will return to Japan having gained valuable international title bout experience. The skillful, resourceful Lee, at age 30, may be well-advised to make one more title run at featherweight. In the semifinal bout, a six-round super lightweight encounter, fast-handed southpaw Ja-Ik Goo (2-0, 2 KO), a former amateur champion, withstood a blistering body-attack from the imposing Kazuki Hayashi (7-5-1, 6 KO). Driven to the ropes, the local Goo—who looked frail in comparison to his Japanese opponent—first fended off Hayashi by landing rapid straight punches in succession, then managed to turn him with a series of straight lefts and uppercuts. The well-muscled Hayashi fought back hard, but a perfectly timed pinpoint right hook to the chin from Goo toppled Hayashi flat on his back for a dramatic finish at 2:20 of the opening stanza. Cut on the bridge of the nose, Hayashi lay spread-armed on the canvas while being attended to by his trainers for some time before rising. Goo was awarded the “Best Fight” of the night award by the KBC for his performance. In a super lightweight four rounder, Sung-Tak Joo (4-0-2, 1 KO) of Suwon, South Korea faced off against Kentaro Endo (3-4, 3 KO) of Yokohama, Japan. Joo, a hot local prospect who comes from a family of kick boxers, and who looked a size bigger than Endo, had some success early on with counter and lead right hooks. However, once the more technically sound Endo read Joo’s timing, he put on a boxing clinic, picking apart Joo with his well-timed, surgical jabs and footwork. From round two on, Endo added right lead, straight left (inverted one-two) combinations to his arsenal. From the third, sensing he was behind, Joo stepped up his attack, while Endo, ever cool under pressure, continued to land his no-motion ramrod jabs to the face of the onrushing Joo. Puffy around the eyes and bleeding from the nose and mouth after the final round, Joo—in the only robbery of the evening—was awarded the hometown decision by scores of 39-37, 39-37, 39-38. In a four round super featherweight bout, talented local prospect Tae-Il Kim (3-0), emerged a clear victor over 5’11” Hikaru Nagai (3-1, 2 KO). The much taller, thinner Nagai advanced behind a high guard with light popping jabs and straight punches, occasionally going to the body with both hands. Kim, who displayed good movement—especially from round three on—landed the cleaner, harder blows to both the body and head throughout. While Nagai persisted in his attacks, he had no answer for Kim’s powerful right hooks and left-right combinations. Kim closed the show well with a left hook to the body, left hook to the head combination that had Nagai covering up in the final round. The final tallies were 40-36, 40-37, 40-36, all for Kim. The opening Korea vs. Japan bout pitted Myung-Soo Jung (1-1, 1 KO) against Akira Ono (4-2, 3 KO) in a four round bantamweight encounter. While Ono displayed a slicing long jab from the outset, Jung hurt Ono with a solid right hook to the chin in round one. Jung continued to trouble Ono with right swings in round two until Ono landed a sizzling left to the body, after which he pinned Jung in the corner and pumped in shots from multiple angles. Ono maintained his body attack in round three, hurting Jung with a left hook to the body, left hook to the head combination. Sending Jung into the ropes, Ono immediately followed up with a flurry, landing a hard straight right just as Jung’s head went outside the top rope, causing Jung’s body—supported by the ropes—to sag. The referee wisely waived off the bout at 1:44. In the opening round of a six round featherweight contest, Woo-Hyun Sun (2-3-1, 1 KO) came on like gangbusters, landing some heavy leather on broad-shouldered Jin-Wook Lim (6-3-4, 1 KO). Lim covered up under the barrage, emerging later in the round to land some light but effective right counters and combinations to the body and head. Lim, a non-stop puncher from Pusan, outworked Sun over the distance, befuddling Sun with a variety of uppercuts and hooks from all angles. Trained by his father, a former boxer, Lim took the majority decision by scores of 59-56, 58-56, 57-57. In a heated four round battle of super welterweights, Hyun-Kyum Park (5-0, 3 KO) had an edge over Joo-Young Lee (1-1) in the early rounds, while Lee battled back later, stunning Park with a series of right uppercuts in round four. This bout was trench warfare from the outset, and Park’s digging left hooks to the body early on made the difference over the long haul, earning him a narrow 2-0 victory by scores of 39-37, 38-38, 39-38. 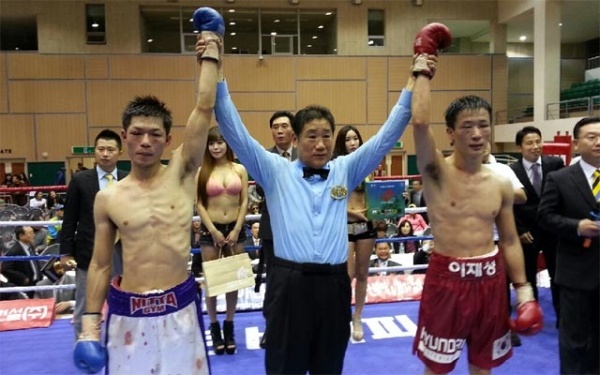 In an ugly, four round super bantamweight bout, Sung-Tak Joo’s brother, Hyuk-Tak Joo (1-1), also a former kick-boxer, duked it out with debuting squat, shaven-pated southpaw Sung-Jin Huh (0-1). Though a bit tight, Joo showed good hand speed, and was able to counter the free-swinging Huh coming in. The energetic Huh often leaped in, scoring with lead straight lefts and right hooks. While Huh liked to come forward and brawl, Joo, on the other hand, had a tendency to hold and clinch. Both fighters got tangled up on numerous occasions, tumbling to the canvas in round three. In the end, Joo emerged with the 2-0 majority decision by scores of 39-38, 39-38, 38-38. In a four round super lightweight bout between debuting boxers, former amateur standout Jae-Hoon Lee (1-0, 1 KO), dropped Joon-Il Choi (0-1) with a right cross during a heated exchange. After Choi rose and immediately (and unwisely) swapped punches with Lee, he went down again hard from a counter right from Lee for the automatic KO stoppage at 2:06 of round two. In a barn-burner of an opening bout of the evening, lightweights Gang-Hoon Lee (0-2) and debuting Byung-Hwa Kim (1-0) exchanged knockdowns in round one. The taller, southpaw Lee started off the fireworks by connecting with a short clean straight left to the chin. Not long after, Kim landed his own right-left hook combination, depositing Lee on the canvas with a thud. Respecting each other’s power, both fighters were more cautious in round two, though Kim proved more aggressive. The taller Lee’s willingness to slug it out at close quarters proved his downfall, as he was dropped again by a tired, bloody, retreating Kim, whose right-left hook combo landed on the button just before the final bell, earning him the unanimous decision by scores of 39-36, 39-37, 39-37.